Gemma Smith has always had one eye on the future. Upon completing university aged 21 she wrote down a list of ambitions and placed it inside the frame of her graduation photo. Smith’s scribbled-down goals had ranged from the modest to the audacious, but chief among them was a desire to finish her career in a national post. It was pleasing, then, to be able to reflect on the fact that she has spent the past seven years working for a club whose reach is global. “That got a tick!” smiles Liverpool FC Foundation’s senior project manager, from behind a desk at the Anfield Sports and Community Centre, base of operations for the club’s official charity. Another list has taken on significance for Gemma recently, only this one wasn’t compiled by her, and rather than self-assessment it is the business community of northern England evaluating her personal and professional development this time around. 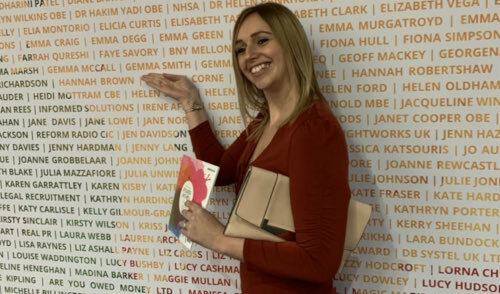 On Monday, at the Manchester Central Convention Complex, she was confirmed as one of the 50 ‘influencers and change-makers’ on Northern Power Women’s 2019 Future List. Founded in 2015 by Simone Roche MBE, the Northern Power Women campaign is designed to accelerate gender diversity throughout the north, with a stated aim of ‘transforming the culture of organisations by recognising, celebrating and showcasing role models'. 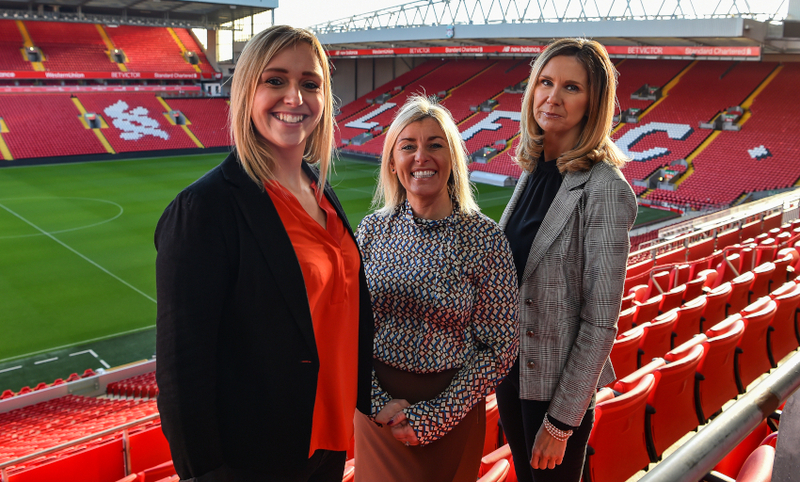 LFC’s director of communications, Susan Black, was also among those honoured at the ceremony, having been included alongside CEOs and MDs of some of the region’s largest organisations on the 50-strong Power List. “To be honest, it’s overwhelming,” Gemma admits. “In the grand scheme of things, as far as awards go for LFC as a club, it’s probably minor, but it’s a movement I’ve followed for quite a while, so I’m completely overwhelmed. These Future and Power lists, once your name is on it, you’re never off it. You don’t get an award as such, you get a pin badge, but I will wear it with pride! LFC Foundation’s office at the ASCC is a hive of activity on the day we visit, providing a clear sense of the vibrant place that the organisation is in at present. Last season, the charity introduced seven new programmes and worked with 100 schools, delivering 78 sessions a week and engaging with more than 15,000 young people. With newly-appointed director Matt Parish in place, fresh initiatives in the pipeline and the showpiece occasion that is the annual fundraising match – this year pitting the LFC Legends against Milan Glorie, with all the 2005 nostalgia that entails – coming up at Anfield this Saturday, the next few months are bound to be exciting, and busy, for Gemma as she continues to settle into her new role, having been promoted from project lead to senior project manager three months ago. “It can be quite manic week to week, we’ve got reports to write for trustees and the Premier League, we’ve got to make sure people are hitting their targets and make sure everything is all right day to day,” the LJMU alumnus explains. “In my new role it’s very much about ensuring that the staff I look after are doing what they need to be doing with their projects. As a delivery unit within the Foundation we also have priorities to look at, so as well as looking after the staff and dealing with any problems that arise, we have priorities regarding relationships with external partners, and a key one for me is the employability element and working with all the right partners in the city. Moving to the ASCC back in April 2016 was a key step forward for the Foundation, not only relocating the charity just a short walk from Anfield but putting it in a position to have a positive influence on an area of north Liverpool that contains some of the most socially and economically deprived wards in the UK. “We were based in Garston for a long time, but I think moving here was the best decision we ever could have made,” Gemma continues. “We had a good relationship with the sports centre anyway, we’re a stone’s throw away from the ground, it ties in with everything the club stands for in terms of looking after people in the immediate community and we work very closely with [community programme] Red Neighbours. “I think people ‘get it’ more, we’re not just these people that rock up at your school; you can come and find us if you want – we’re here, this is such a well-used sports centre and the community use it every day. They get to see us with our LFC kit on, they get to see the lads coaching and the girls’ session that goes on, that’s quite visible and you can’t put a price on that. Originally from Rochdale, Smith first moved to Liverpool 15 years ago to study sports development with PE at LMJU. 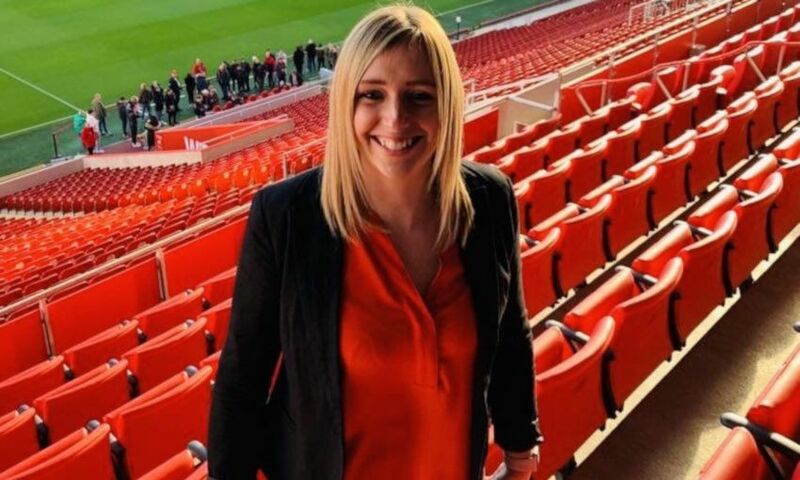 After working as a sports development manager with a private recreational trust on the Wirral and an area manager with Liverpool Council as part of their physical activity and health strategy, she joined LFC Foundation in 2011, and a couple of years after that gave birth to her daughter. Gemma describes herself as a ‘modern-day super mum’ at the top of her self-penned Northern Power Women bio; while being five-year-old Isabelle’s mother is a huge part of her life, it hasn’t hindered her career one iota. Gemma lives near Prenton Park in Bebington, and often takes a walk to the ground with Isabelle to cheer on Liverpool FC Women and be reunited with an old friend: Vicky Jepson. 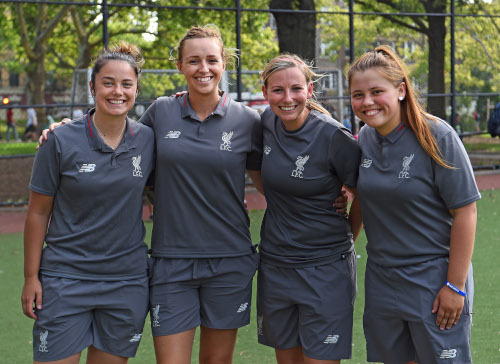 The two met when Jepson was working as a coach with the Foundation, before she stepped up to become LFC Women’s full-time manager last October. “I wasn’t introduced to women’s sport at all when I was growing up, it wasn’t as big as it is now, and I think I’ve got to do more for my daughter to show her that whatever she wants to do, she can do it,” says Smith. “I think I’ve got a duty to support the Women, and I’ve got a duty to encourage my friends to go along and take their kids. It’s really affordable, it’s Liverpool, Mighty Red is there for the kids, and it’s a great day out. “I took Isabelle to the first game of the season and we were looking through the programme together, and I said, ‘Look, Vicky is mummy’s friend, you know Vicky.’ Up on her wall, the only poster she has is of the Women’s team. So, what’s next for Gemma? “We’ve got a brilliant initiative which has just been announced in the last couple of weeks, it’s called The Twinning Project and is headed up by [former Arsenal vice-chairman] David Dein. He had this grand idea to match football foundations/clubs with prisons,” she explains. In the short term, though, Smith can take pride from a big night in Manchester and a very well-earned pin badge. Another list and a new photo frame might be called for soon. ‘Behind the Badge’ is a regular feature on Liverpoolfc.com which aims to tell the individual stories of the numerous men and women who work tirelessly away from the spotlight in an attempt to make Liverpool FC successful. We speak to various members of staff across the first-team, Academy and Women’s set-ups who dedicate their lives to the club each and every day, covering a variety of different roles that make a vital contribution in preparing the Reds for action.